One of the largest traditional market in South Korea, 남대문시장 Namdaemun Market 南大門市場 has been opened since 1964. There are stores that serves as wholesale markets (starts from 11pm to next day wee hours), as well as retail sections (some stores start from 9am onwards, with push carts coming out closer to 11am). With more than 10,000 stores, all sorts of stuff can be found here, including clothing, accessories, toys, kitchenware, etc. Of course, there are plenty of food options as well, from snack stalls to cafes and eateries. It seemed impossible to finish seeing and eating in one day. First thing we did was to get a map of the Namdaemun Market at the Information Centre near Exit 5 of 회현 Hoehyeon Station 會賢站 (Subway Line 4, Station Number 425), or you can get a copy from here. We also spotted staff stationed at different areas to help lost tourists. 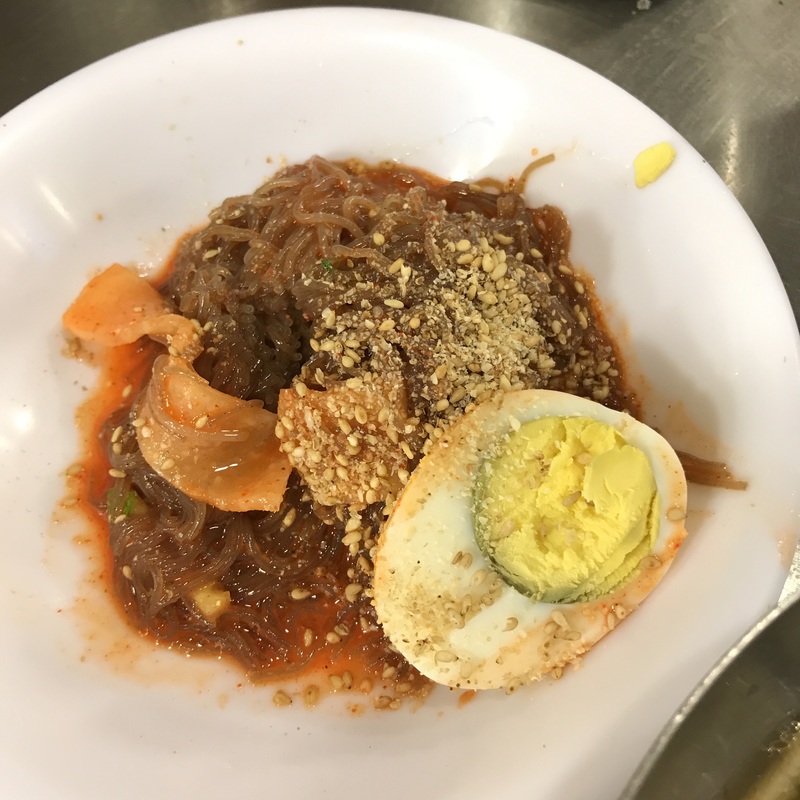 The first few stalls were quite aggressive and calling out to us, which made us feel a little uncomfortable, but to be honest, I think the food should be of similar quality and pricing for all the stalls. The only difference would probably be the “side dishes” served together with the mains being ordered. 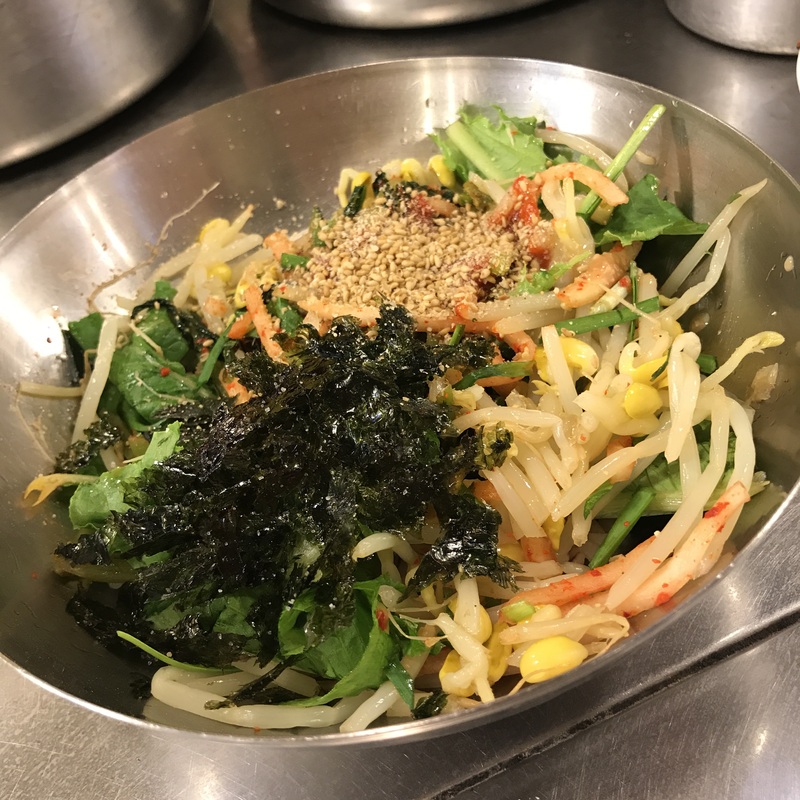 We ordered a 칼국수 (Kalguksu) Knife-cut Noodles 刀切面 (₩5,000) and 1 rice 보리밥 (Boribap) Barley Rice with Vegetables 大麥飯 (₩5,500). 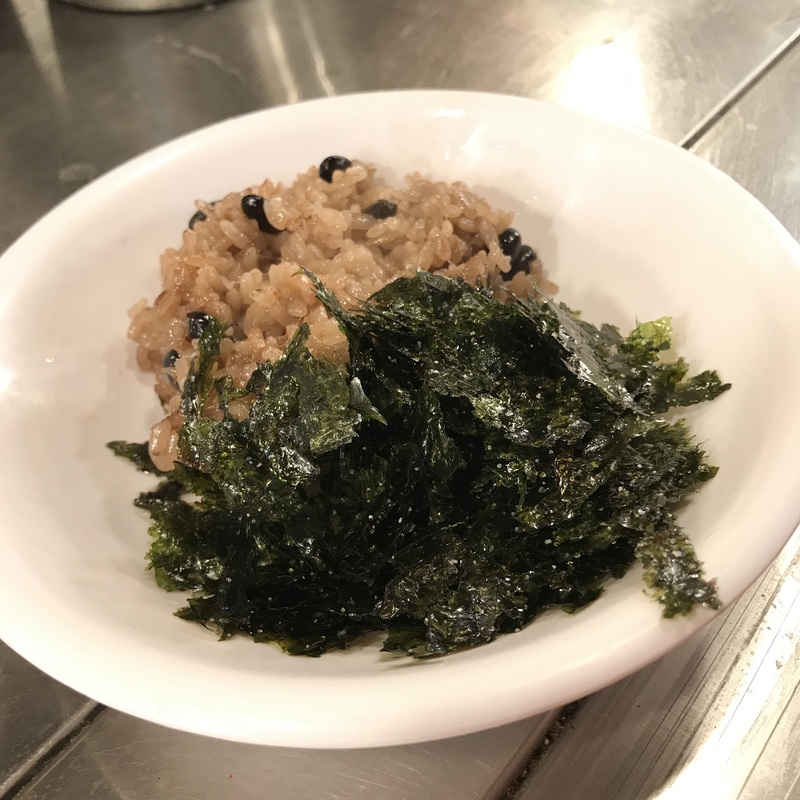 Then we kept hearing the ajumma saying “送的，送的”, so the hand cut noodles came with 찰밥 (Chalbap) Glutinous Rice 糯米飯, the barley rice was served with a small bowl of knife-cut noodles… Then suddenly we also had a small serving of 냉면 (Naengmyeon) Cold Noodles 冷麵. All these were served with a huge smile, making us feel very welcomed! 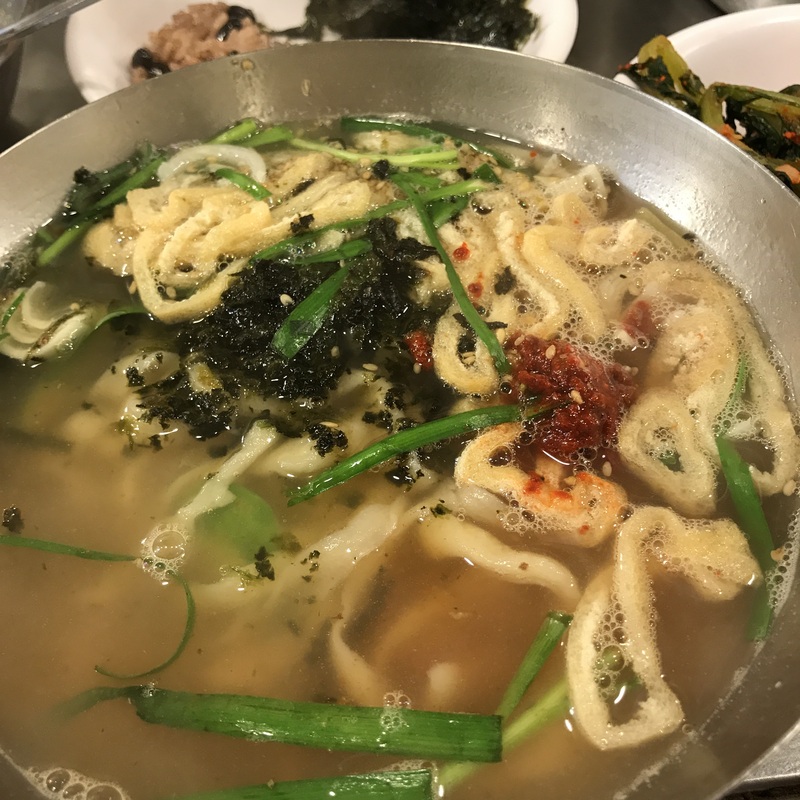 In addition, there was also side dishes such as kimchi and soup. It was a very delicious and heartwarming meal! We had a coffee break at Namsan Coffee, after much (window) shopping in Namdaemun Market. The seating area upstairs was quite nice, and we had a 카페라떼 (Kape Ratte) Cafe Latte 拿鐵 (₩3,000), and 오미자차 (Omija-cha) Magnolia Berry (aka five-flavour fruit) Tea 五味子茶 (₩3,000). The fruit is said to possess 5 basic flavours, namely sweetness, sourness, bitterness, saltiness, and pungency (spiciness). It was said that depending on body condition, the tea would taste different for each individual. Well, I certainly tasted the sweet and sour part the most, and enjoyed the drink very much 🙂 The latte was pretty decent too, though slightly on the more acidic side. We found a small take-away coffee place, near Namsan Coffee. The 카페라떼 (Kape Ratte) Cafe Latte 拿鐵 (₩2,500) was very nice and strong, and I was pleasantly surprised at the amount of dates inside my cup of sweet 대추차 (Daechu Cha) Jujube Tea 紅棗茶 (₩2,500). 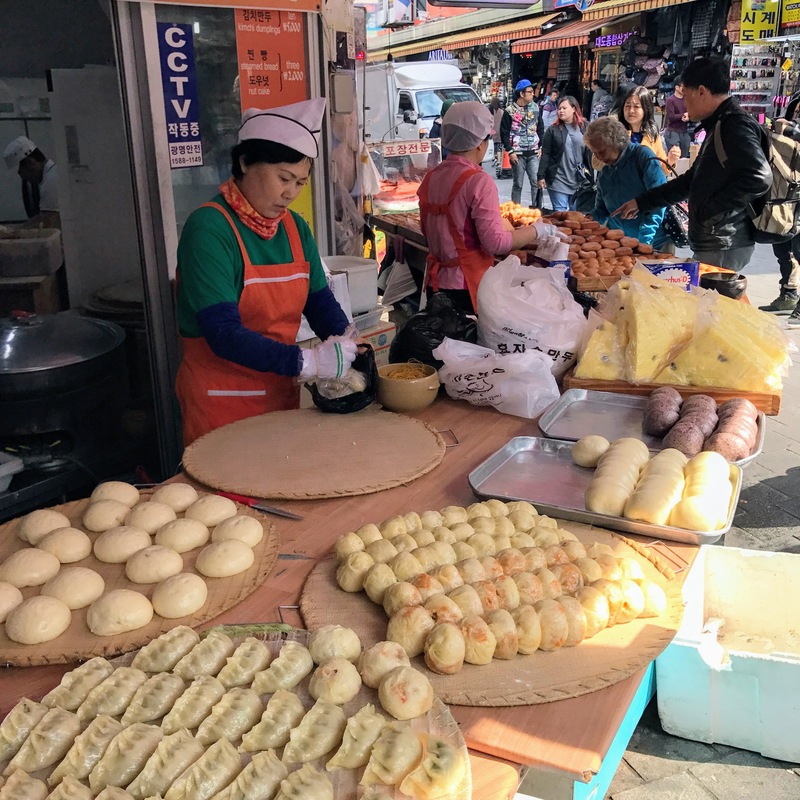 The Ajummas were hard at work, making buns and mandu non-stop, and with the never-ending queue, we could expect freshly made snacks here! 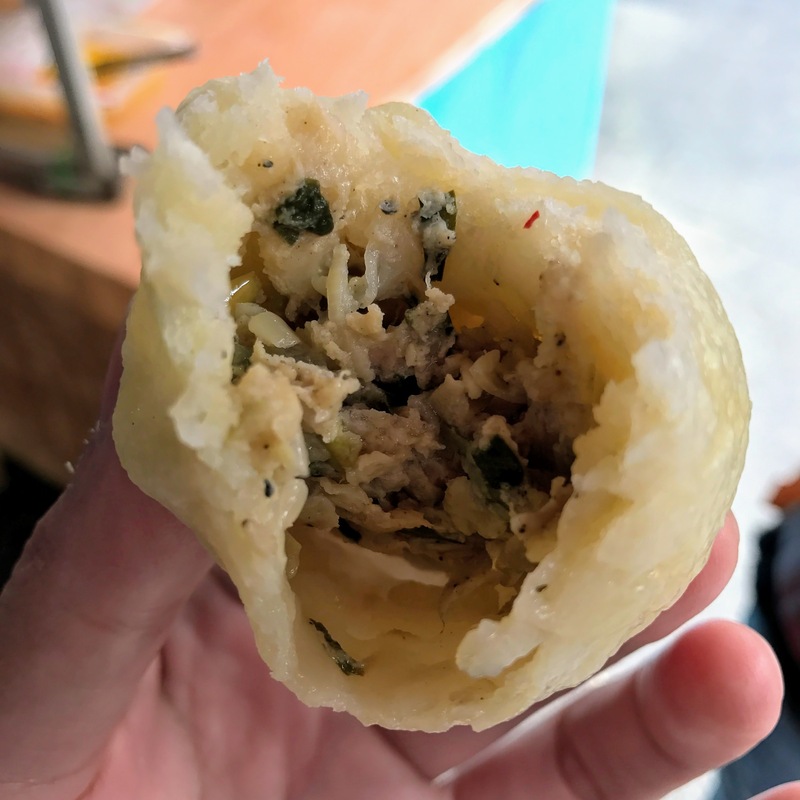 We ordered a mix of 3 고기만두 (Gogi Mandu) Meat Dumplings and 2 김치만두 (Gimchi Mandu) Kimchi Dumplings for ₩5,000. Served piping hot, these resembled Chinese buns and were very juicy! The kimchi bun was not as spicy as we feared, and we enjoyed both versions very much. 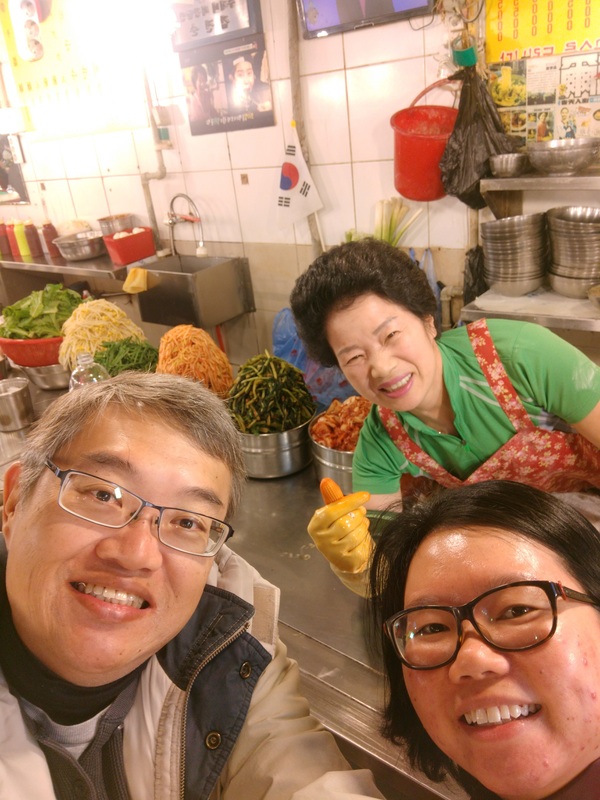 It was difficult to miss the vendors selling 족발 (Jokbal) Pig’s Trotters 豬腳 in Nandaemun Market, for in addition to the air-conditioned eatery space, each of them also had a take-away booth, and we could see the ajummas chopping away. As we were quite early today, there were no queue at any of the stalls, so we simply picked one that looked quite delicious and ordered a take-away of pig’s trotter for ₩4,000. Ooohh, sticky and chewy, the braised pig’s trotter was full of collagen yummy-ness! 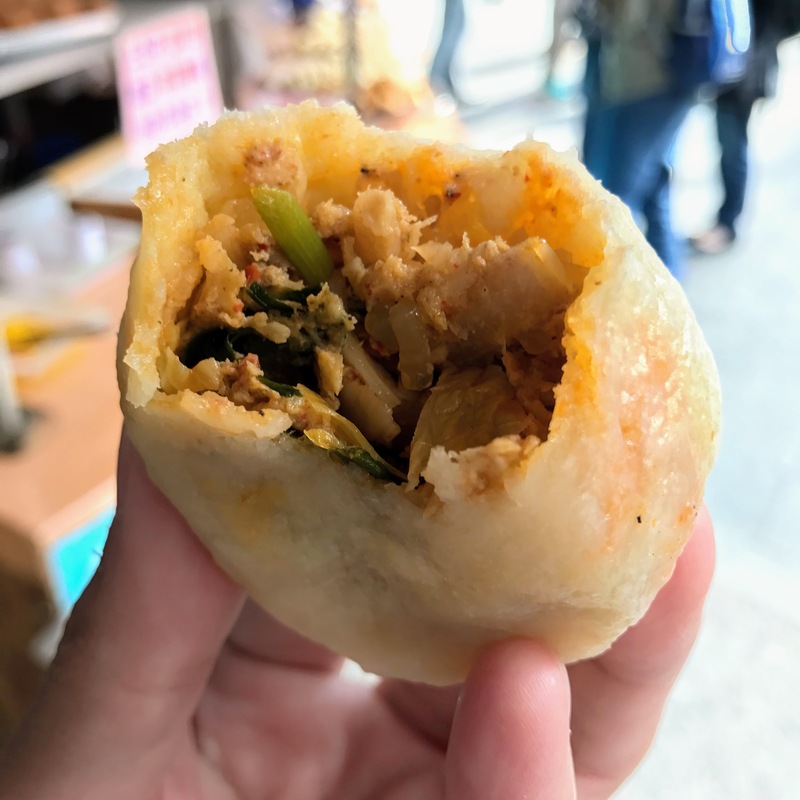 We also tried the 잡채호떡 (Japchae Hotteok) Vegetable Pancakes 烤雜菜餡餅 (₩1,500) near Gate 5 of Namdaemun Market, which was pretty awesome; the soft dough with its exterior made crispy after deep frying, went well with the savoury fillings of vegetables and glass noodles. Directions: Take Exit 5 or 6 of 회현역 Hoehyeon Station 會賢站 (Subway Line 4, Station Number 425).